Crocus bulbs are a perennial favorite best planted in large numbers, and are frequently used as colorful groundcover. They are easy to grow and depending on the variety thrive during the late winter months and early springtime. They are wonderful for adding early season color to your perennial garden, along walls, borders, or even spread out in your lawn. The crocus is a cherished perennial flower that grows 3 to 6 inches tall and has yellow, purple, lavender and white cup shaped blooms. A member of the iris family, the crocus is a hardy plant that generally blooms early in the year, apart from a handful of varieties of crocus that bloom during the fall. For a dazzling springtime show, these colorful flowers are really difficult to beat. They are the ideal choice for planting in rockeries, naturalizing in grass, or growing in large groups underneath shrubs and trees. Simply scatter a small number of crocus bulbs and plant them where they fall for a really natural effect. 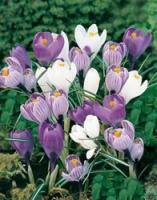 Crocuses perform best in a sandy, well-drained soil. If you do intend planting in the lawn, make sure not to cut the leaves off when the lawn is mowed as the leaves are necessary for photosynthesis to develop new bulbs for the following season. For a really massive effect, plant them in massive sweeps of 100 to 150 bulbs. Alternatively, if you require a more compact display, you can grow them in containers or window boxes where you can delight in their gem like flowers. They tend to do well with full exposure to sun and can grow in poor to average soils, if the soil is well drained. Crocus flowers look their best when they look natural. Groups of these tiny colorful flowers waving about in the garden, under trees or dotted throughout the lawn make a splendid sight during the early spring. The earliest ones are generally those planted in lawns, since their flowering has finished by the time the first mowing is due. Planting crocuses outdoors is best carried out in the fall when the weather is cooler. They should be planted 3"-4" deep in places where they are likely to remain undisturbed. They also do well in rockeries and borders when sheltered by larger shrubs and plants. They are great for low maintenance gardens a shardly any maintenance is required, although they do like to be watered on a regular basis early in the year and in the fall. This is also true during the winter months if there is little rain or snow. If you intend to plant Crocus bulbs indoors place them in bulb fiber in pots with drainage holes. Water them in thoroughly and place them in a cool place such as your garden shed. Ensure that they do not dry out and only move them to a light cool place indoors when the first shoots appear. This particular Crocus 'Assorted Colors', 'Crocus giant', is planted during the fall, which in turn heralds in spring, and cheers up the garden after a dull and long winter season. They bloom profusely in whites, yellows, blues and purples. Some are solids, others are two-toned. Their cupped flowers have short stems above grasslike leaves. They can be planted in rock gardens, among ground covers or anywhere you need brightness and color in late winter. These bulbs are care-free and are amongst the most favored bulbs used in the landscape. ' Assorted Colors' blooms during the early spring and has a 3 week bloom period.